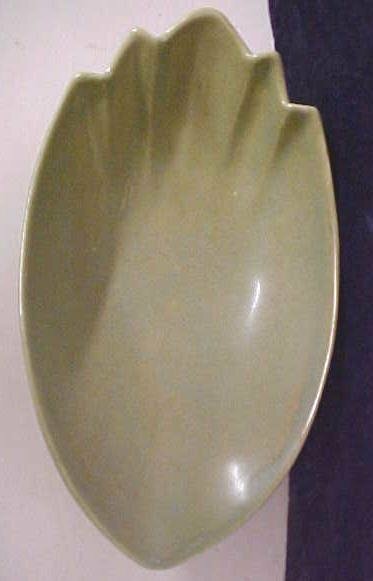 This is a rare shell patern gravy shaped bowl, in a rare medium green color. It is marked "ROSEVILLE U.S.A. 529-9" on the bottom. We see no chips or cracks, a few original minor matte finish glaze flaws, only one inside the bowl, a faint line about 3/4" long, and a few spots on the exterior, otherwise in very good condition. This bowl is 2.6" tall x 5.25" wide x 9.2" long. A rare and hard to find pattern bowl, in a rare green finish! Items Similar To "Roseville Gravy Bowl No. 529-9 Green"